When you meet our fully qualified clinician you are assessed and provided with a bespoke AFO for your individual condition/requirements. Each patient is different, what works for one patient may not work for another and your clinician will be able to assess the best course of treatment for your unique physiology. The AFO you are provided with will help to raise your foot up to the correct position and improve mobility and function. What it does: Improves your life through our expert clinical care and solutions. The AFO will support and control movement as well as restoring some function at the Ankle, Foot and Knees. The AFO will also reduce symptoms such as pain and pressure. 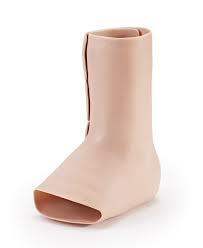 Silicone AFO: gives a more realistic appearance to your AFO for discreet use. Dynamic Ankle Foot Orthosis: Different from a traditional Ankle Foot Orthosis (AFO), which is typically stiff and rigid, a DAFO is characteristically thin, flexible and wraps around the patient’s entire foot in order to provide improved sensation and alignment. Initially designed for use by pediatric patients but now sometimes used by the adult population, a DAFO encourages range of motion, allowing children to learn movement by moving and providing minimal support, only where the patient needs it. 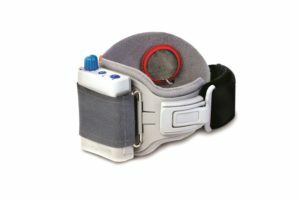 DAFOs are frequently prescribed to assist with mobility and motor skills of children with Cerebral Palsey. Ground Reaction Ankle Foot Orthosis: Used to control instabilities in the lower limb by maintaining proper alignment of limbs and controlling their motion. It is often used to try and maintain the length of the hamstring and prevent crouch gait which is one of the most prevalent of movement disorders among children with cerebral palsy. an Orthotic device worn in bed to protect the foot from hyper-extension and damage. Provides greater control through electrical stimulation of the muscles in the foot to prevent foot drop. Rigid side helps secure the cuff and enables easy one-handed application. Electrode locators help ensure precise electrode placement every time to optimise stimulation. Washable liner for patient comfort and hygiene. Vented design allows for increased air circulation and breathability. Visual indicator helps align the WalkAide system for consistent positioning. Universal fit – can be used on either the left or right leg.